Neverending fun is guaranteed with our Parking Games! The best parking free games are waiting for you at Miniplay, so 3... 2... 1... play! Know our Boat Parking Games, Truck Parking Games and Car Parking Games, choose between lots of games and press play! Mario is used to facing the most complicated challenges. Today he's coping with a more everyday one parking in these lots where obstacles and badly-parked cars are common. 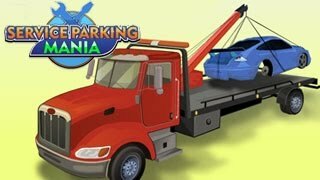 Put your skills to test and try to park in this super fun 3D game! Dodge the obstacles in your way and find the perfect spot in 30 different maps. Choose the difficulty level and enjoy! Would you like to work as a truck driver? Put your parking skills to test and complete the challenges in each level. Try to control your nerves and do it as fast as you can. Have fun! Perfect your steering and parking skills! Choose one of the sports cars, follow the spots in each stage and manage to park before running out of time! Your job starts and midnight -- drive stolen cars and deliver them in time without raising suspicion. Steer carefully and stay away from the cops while keeping the cars as good as new! 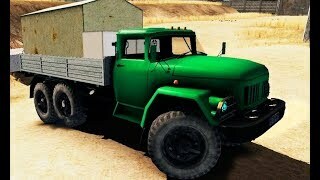 Enjoy this very realistic truck-driving sim! 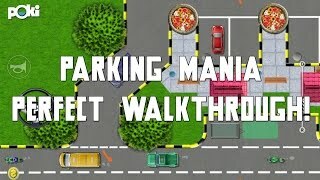 Move across a huge city and manage to park on the right spot without crashing into the obstacles in your way. Complete every mission! Manage to park this vehicle on the streets... On the 4th of July! Dodge the obstacles in your way and find a spot in each stage. Good luck with that! Drive a huge truck around this city and manage to park on the right spot. Avoid crashing into other vehicles and break your own time record! Get ready to put your driving skills to test. Follow the arrows and manage to park without trouble. Avoid crashing into the obstacles in your way and have fun! Choose your vehicle and get ready to speed up around wonderful 3D stages! Complete your mission and manage to park it before time's up. Put your great driving skills to test, customize your ride and have fun! Steer a huge 4x4 around some difficult tracks and deliver your cargo in time. Be very careful not to lose anything on your way and clear all 30 stages! The police from Dubai need their own super cars in order to catch the drivers that surpass the speed limit. Before putting them to work, you'll need to take them to the station and park them safely -- try to avoid every obstacle! Learn to control your vehicle and try to park it properly. Enjoy the 3D graphics and move around the streets dodging all kinds of obstacles. Good luck! Put your driving skills to test with this enormous truck! Smaller cars are easy to control, but how will you manage the massive cargo? Carefully step on the gas and avoid all kinds of obstacles in order to park on the goal spot. Good luck! Enjoy this game -- it's not only about parking! Choose the vehicle you prefer and get ready to dodge the obstacles in your way while you try to park on really tight spots. Put your skills to test and try not to scratch your car! Get ready to control a powerful speed boat!! Rush on the high seas and manage to get the first position. Good luck! Do you have some parking skills? 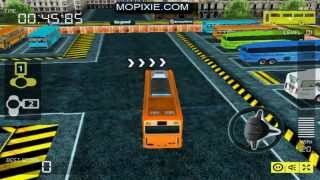 Drive this bus and try to look for the right lot in each stage - dodge the obstacles! Drive through a world based on Five Nights at Freddy's. Dodge the obstacles and manage to park your vehicle. If you follow the light it'll be easier to clear the stages! Have you ever wanted to feel what it is like to be a taxi driver? Steer around a city full of cars and manage to reach your destination. Be careful and try to park! Drive a firetruck, find the right path in order to reach the burning building and dodge the obstacles. Will you put out the fire before it's too late? Good luck! Are you ready to enjoy this unique parking experience? Steer this chunky vehicle around an industrial train station. Find the right spot and try not to crash! Have you ever thought about controlling a crane? These huge vehicles are not easy to control! Follow the instructions and manage to park it before running out of time. Are you ready for this? Are you ready to drive a limo?! Control this one and take it to the right place in each stage. Dodge the obstacles and manage to stay at least 5 seconds on the right parking spot in order to make it to the next level. Good luck! Drive an ambulance to the right parking in each stage before running out of time! Will you be fast enough? Feel the adrenaline in your veins! Drive on of the fastest and biggest vehicles in the world across a very detailed stage and try to park it properly. Have fun! 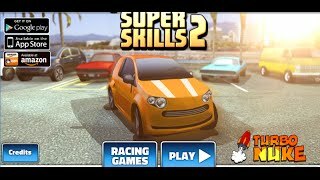 Drive the most amazing sports cars - such as Lamborghini, Ferrari and Mercedes - across a lively city and park them on the right spot in each stage. Do it in as little time as possible and have fun! Every year, new cutting-edge vehicles are released, but the most impressive ones are still the big old classics. Drive cars from the 50s and take them to their destination without even scratching them. Drive a taxi across Miami! Pick up your passengers and drive carefully. Get to their destination as fast as you can and try not to crash or scratch your car - repairing it is really expensive. Have fun and don't run over anybody! Can you park on the right spot? Drive carefully, keep an eye on the speed limit and try not to crash. Have fun! Is this your first chance to control a drone? Enjoy flying across cities and find the right place to land. Enjoy the wonderful 3D graphics and complete all 10 levels to prove your skills. Try working as a postman around town! Deliver the parcels and letters as fast as possible, try not to have any accidents and park your vehicle properly. Drive a taxi around Dubai and manage to reach your destination. Pick up your passengers, don't speed up and try not to crash. Have fun! We're sure you're a great driver, but can you control a plane? Get on this fighter aircraft and manage to park it on the right spot without crashing into any of the obstacles. Have fun! If you think parking is hard, imagine controlling a huge T-Rex around an abandoned town. Take this mom to her eggs while dodging all kinds of obstacles. Have fun! Take your remote control and get ready to drive this wonderful car! Can you park on the right spot without crashing into the obstacles or falling? Put your driving skills to test in 10 levels inside an office. Enjoy this sequel! Try to park your car on the right spot without crashing into anything around you. It looks easy, but not when you've drunk too much! Will you make it? By the way, don't drive drunk! Drive army cars to the target spots! Follow the right track, don't make any mistakes, collect every guidon and complete your mission. Put your driving skills to test in the Army! Rescue the survivors with the help of your van and take them to a safe area. 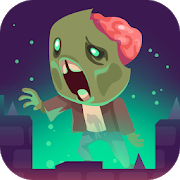 Good luck in this zombie invasion! People are so bad at parking! Drive this muscle car dodging the obstacles and try to park it on the right spot in each level. Will you make it? Detroit is a city taken by crime! You'll control a police officer whose mission is to arrive to the crime scenes as fast as possible and find the right spot to park his vehicle. Enjoy the 18 levels in this amazing 3D game! Carefully drive a SUV around town and park on the right spots. Do it as fast as you can and try not to crash. Good luck! Park this car on the right spot in each stage dodging the obstacles you come across. Prove you're the best driver! Prove you're the best taxi driver by picking your customers up and taking them to their destinations in as little time as possible. Dodge the obstacles in your way! 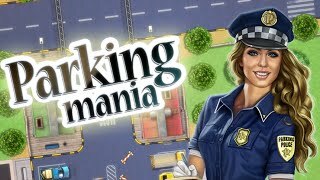 Manage a parking lot facility and try to earn as big as you can. Take care of the cars and drive them as carefully as possible so that your clients can be happy with your services. Keep parking! You're in charge of parking celebrities' luxurious cars. Do it correctly and don't scratch the vehicles! Warmer weather is here, and beaches start to be full. You found a job as a parking attendant in South Beach look for a free place and avoid scratching the cars. Are you good at parking your car? Finish every level without scratching it! Help Spongebob park his boat in increasingly difficult lots but try not to damage it! Drive Scooby-Doo's famous van and park it properly before time's up. Be careful and avoid hitting the obstacles! There is risk of fire in town, so drive this firetruck, head to the fire as fast as you can and prevent it from getting bigger. Can you save everyone? Drive this truck and be especially careful when obstacles are near and when parking. Try to beat every parking challenge and unlock new cars and levels! Practicing will make you become a renowned driver. 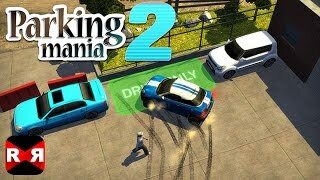 In this game you'll have to drive carefully and park the police cars in the right spaces without crashing into the obstacles. Don't hit other cars you'll have to start all over again if you do. Control this ambulance driver! Rush to the hospital, but try not to hurt your patients. Find the right spot to park the ambulance and help them reach the emergency unit safe and sound. You're in charge of parking these luxurious cars. Do it correctly and don't scratch them! Prove your steering skills in this wonderful 3D game. Who will be the best driver? You'll have the chance to show your parking and carrier skills – have fun! Some people don't really know how to park! Drive your car, dodge the obstacles and park where you're told to in each level. Freeze Police! 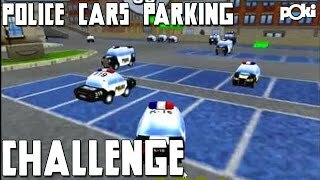 Police Cars Parking Poki Challenge! Do Some Truckin'! 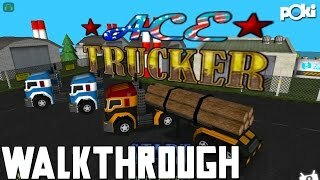 Ace Trucker Poki Walkthrough!